D.C. Council member Muriel Bowser won the April Democratic primary with 44 percent of the vote. She’ll face off against Council member David Catania, an independent, in November. The benefit of starting your GW career during a midterm election year? Not only will you have a chance to campaign for candidates with some of the most politically active College Democrats and College Republicans chapters in the nation, but you will also witness a D.C. mayoral race. Intrigued? Here are the top six people and bodies you need to know before starting classes in Foggy Bottom. The D.C. Council is the city’s legislative body, made up of eight representatives from each ward plus five at-large members. Because D.C. is a federal district rather than a state, every piece of legislation the Council passes and the mayor signs has to go to Congress for approval. In the past year, Council members have voted to decriminalize possession of small amounts of marijuana, though that move has come under scrutiny in Congress and has yet to go into effect. The Council also passed a bill to raise the minimum wage at large retailers from $8.25 to $12.50 an hour, a measure the mayor later vetoed. D.C.’s lame duck mayor is an alumnus who has held office since January 2011. Gray, 71, lost his re-election bid to Muriel Bowser in the Democratic primary in April amid allegations that he accepted illegal contributions to his 2010 campaign. Businessman Jeffrey Thompson pleaded guilty in March to illegally funneling more than $660,000 into Gray’s campaign, but the mayor denies any knowledge of the shadow campaign. As a student, Gray was a member of the Jewish fraternity Tau Epsilon Phi and was involved in the GW Newman Center. 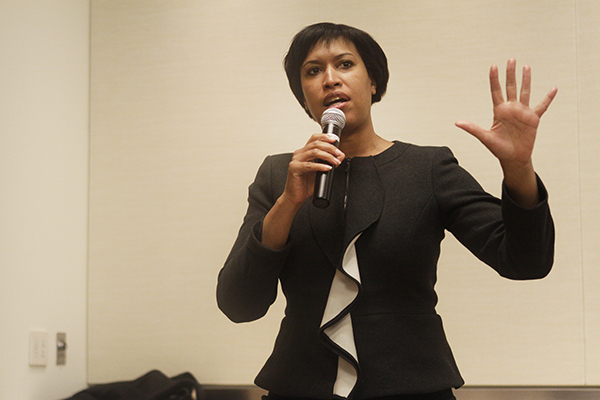 Muriel Bowser, 41, represents Ward 4 on the Council and is the Democratic nominee for mayor. She defeated incumbent Gray and seven other candidates in April, and is preparing for the general election in November. Her campaign is focusing on homelessness, education and income inequality. David Catania, 46, is an independent candidate for mayor. He is openly gay, a former Republican and now serves as an at-large Council member. He chairs the Council’s education committee and has made education reform the center of his campaign. He faces the challenge of convincing D.C. voters that he should be the top executive in a city that has only ever elected Democrats to the office. Aside from minor, third-party candidates, Catania is Bowser’s only other contender. The Republican Party has yet to name a candidate. 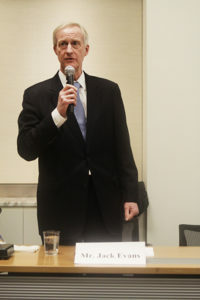 Jack Evans has represented Ward 2 for more than two decades on the D.C. Council. GW falls right in the center of Ward 2, which long-serving D.C. Council member Jack Evans represents. Evans, 60, ran in the Democratic mayoral primary in April. In his second mayoral bid he won 5 percent of the vote, competing against seven other candidates. The finance and revenue committee chair focused on infrastructure and economic development in his bid. Evans is one of the most active supporters of a proposal to build a new soccer stadium for D.C. United. He also works as a lawyer for the Patton Boggs law firm in Georgetown, allowing him to earn more money than most other Council members. Eleanor Holmes Norton is the District’s non-voting representative in Congress. A 76-year-old native Washingtonian, she has served in her post for more than 23 years. She sits on the Committee on Oversight and Government Reform and the Committee on Transportation and Infrastructure. During her tenure, she has advocated for giving D.C. a vote in Congress, and has also fought to make the District the 51st state. Norton is up for re-election this November.